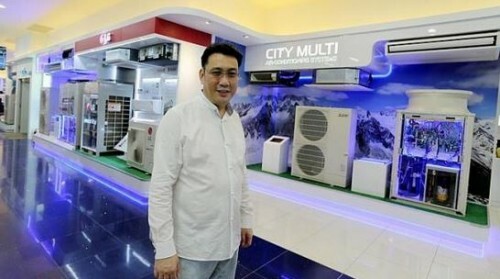 HOME-GROWN electronics giant Gain City has spent about $70 million to construct an 11-storey building in Sungei Kadut, joining other companies in the growing trend of warehouse retailing. The new building has a total floor area of about 50,000 sq m, about the size of seven football fields. A fifth of this space will be used for retail. It will have its own diesel pump for the company's 175 delivery trucks and vans. The building also has warehouses, offices and a carpark. There are sound rooms where customers can try out sound systems from different brands. There is also space for events such as cooking demonstrations which use Gain City's kitchen appliances. Other facilities include a cafe, a two-storey sky terrace and a play area for children. Explaining the need for a megastore, managing director Kenny Teo said: "Electronic items are getting larger. A 20-inch television set used to be considered big. "Now, TV sets are double or even triple that size. We need more space to store them and to sell them." Gain City Megastore @ Sungei Kadut officially opened on June 5, adding to the company's 10 smaller outlets. Sungei Kadut, an industrial estate in north-western Singapore, is home to more than 15 furniture manufacturers. It was announced in March that the JTC Furniture Hub will be built there. Gain City Megastore is among the new players in warehouse retailing in industrial estates. Big Box megastore in Jurong East and FairPrice's members-only Warehouse Club in Joo Koon opened last December. Earlier entrants include Courts, Giant and Ikea, which are all in Tampines. Business has been booming for these retailers. About 600,000 customers shop at Big Box a month, and its deputy chief executive officer Julia Tong-Sng expects the number to grow by 25 per cent by the year end. Warehouse Club has attracted about 30,000 members, up from 24,000 members at the start of the year. Members buy groceries and household goods in bulk for up to 20 per cent savings. A FairPrice spokesman said that weekday customers are mostly housewives and factory workers from nearby industrial areas. On weekends, the store is visited by families and groups of multiple families shopping together. Giant's Tampines megastore serves more than 100,000 customers a month, a number that is growing by at least 10 per cent year on year. This growth, said its spokesman, is "better than average store growth in terms of sales and customer count". "The basket size for our mega- store is three times bigger than the basket size for supermarkets," she said, adding that many people might see grocery shopping at the megastore as a family outing rather than a chore. For Gain City, having its own megastore means savings in rental, Mr Teo said. Rent makes up about 30 per cent of business costs. Other cost-cutting measures include having a diesel pump equipped with a 40,000-litre tank to cut down fuel costs by about 20 per cent. The chain now spends more than $50,000 a month on diesel. The savings in business costs enable the megastore to offer prices up to 20 per cent lower than at its other outlets, said Mr Teo, whose brother set up the company in 1981. Travelling to megastores in far-flung industrial estates is not an issue for Mr Samad Kassan, 55, a father of four. The dispatch driver, who lives in MacPherson, makes monthly trips with his wife to the Giant Hypermarket in Tampines to stock up on items such as toilet paper. "We buy in bulk to save money. These warehouse stores are good because they have everything," said Mr Samad. "I don't mind travelling, because it's just one trip a month and we buy enough to last us the entire month."